Based on the fact that I am a huge car enthusiast, I have decided to explore the concept of collective intelligence on the Wikipedia article about the Lamborghini Aventador. According to Henry Jenkins, collective intelligence is defined as “the ability to pool knowledge and compare notes with others towards a common goal” (Jenkins, Part 2). He continues to emphasize this by stating that “nobody knows everything, everyone knows something, and what any member knows is available to the group as a whole at a moment’s notice” and this is exactly the way that Wikipedia works. People all around the world come together, knowing only bits and pieces about a topic, and combine their knowledge to create a rich database of information. This is definitely the case with the Wikipedia article on the Lamborghini Aventador, as the page has only existed for four years, has over 1,200 edits, and is edited on average once every day. 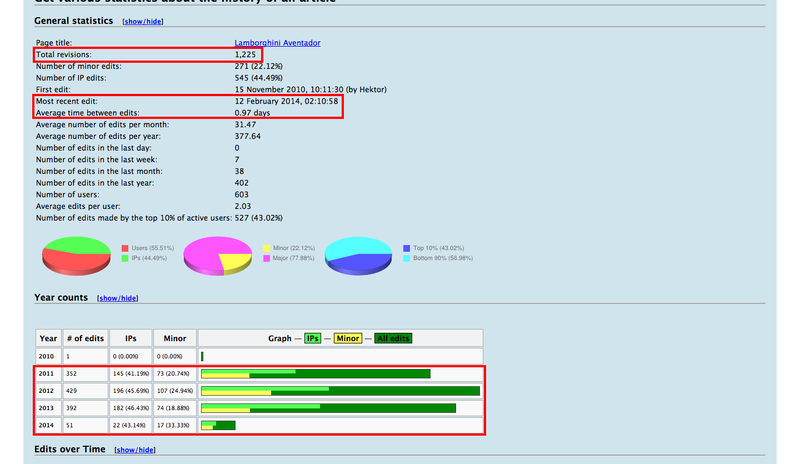 This data is depicted in the image below. As I first read through the page the first time, I could definitely confirm that the majority of the information was correct. Although the page is not too lengthy, there are over 46 references to reliable sources that validate the information. However, a few things on the article did surprise me: the first sentence of the article states, “The Lamborghini Aventador is two-door, two-seater sports car” and this is definitely not the case, as the Aventador is classified as a supercar. I cant believe that a page with over one hundred editors who have knowledge about cars that not a single person addressed this. Additionally, the price of the car was not included anywhere in the article, which is very unusual as this is one of the main things people are interested in. Overall, I strongly believe that this article is a fantastic example collective intelligence in our culture. 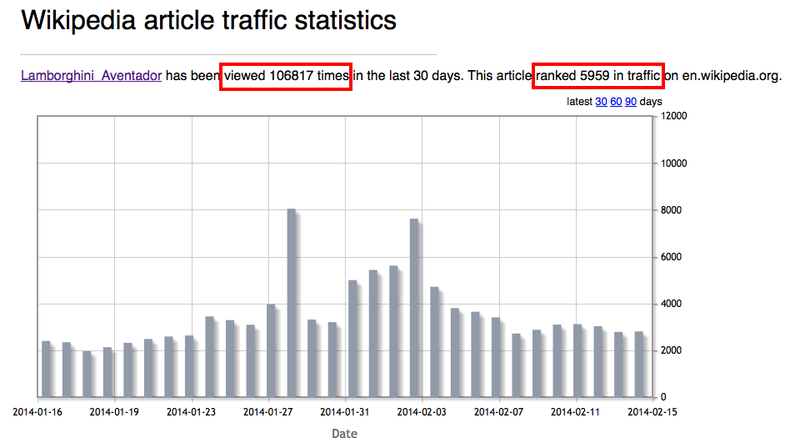 The article has only existed for about 4 years, and it is ranked 5,959 for traffic on Wikipedia and more information is added and edited on the daily basis. The image below further demonstrates how popular the article is in our culture, as the article also has had over one hundred thousand views the past month. It really does a great job of providing a vast amount of information about the car that most people would be interested knowing that visit the page. However, I do believe that the page does need some work, but it seems as if our community is actively working on this. Even though it does not include all of the technical specifications about the car, I don’t believe that this is a problem because people that are really interested in them will do to the official website to obtain this information. This article definitely depicts the concept of collective intelligence, showing how people all around the world can come together with their knowledge and combine it into one document for our community to learn from. In Tom Gunning’s essay, Re-Newing Old Technologies, Gunning argues that in order to learn from a cultural history of technology, we must go back tin time and revisit when the old technologies were new (Gunning 39). One piece of technology that significantly shifted our social culture was the first iPhone, which was released on June 29th, 2007. The iPhone was truly revolutionary at the time, dramatically changing the way that we communicate with the world with the first true touch screen and its vast amount of features no other smartphone could compete with (Frommer). 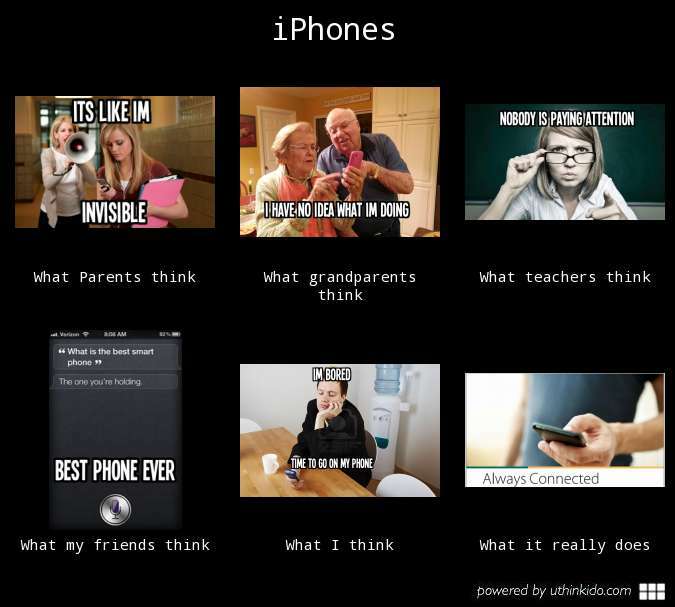 The following meme depicts how various groups of people conceptualize the iPhone today. 1. A striking experience, usually visual, but sometimes aural. 2. A consequent physical paralysis. The first time I saw and got the chance to use the first iPhone was incredible. I remember how sleek and well designed the phone was, and all I could think about was how bad I wanted to have one. As soon as I picked the phone up, I immediately entered the second stage of amazement. It was like I got locked away in a room with just the phone. Nothing else seemed to exist around me; I was truly engrossed in the phone and began to discover and learn about everything little thing on the phone. This then led me right into the third stage; I began to understand all of the little nuances and was able to navigate the phone perfectly in order to do what I wanted to do. This inevitably put me into the fourth and final stage: a new action. After I learned everything about the phone and all of the things it was capable of doing, I found myself checking my phone hundreds of times a day; whether it was to surf the web or play a game, it did not matter. This concept of being “glued” to your phone is clearly demonstrated in the meme above. For example, in the first image that depicts what parents think of the iPhone: the mom feels invisible to her daughter who is engrossed into her phone. Additionally, the third image shows how teachers feel like nobody is paying attention to her because all of her students are too distracted from their phones. While the iPhone changed our culture significantly, nothing has come along in the recent years that is “new” like the iPhone was at the time of its release. All the new iPhones are small upgrades to the same concept that generally serve the same purpose as the first one. This really draws some questions in the sense of when something really “new” will come along and revolutionize the smartphone world again and change our culture. Frommer, Dan. “10 Ways The IPhone Changed Smartphones Forever.” Business Insider. Business Insider, Inc, 19 June 2009. Web. 25 Jan. 2014.